View the full Social Media Trends 2014 SlideShare summary here. It’s time for the second instalment in our Social Media Trends 2014 series. In part one we looked that the likely shift in media buying budgets from traditional paid advertising into content promotion. Part two looks at the rise of niche interest networks which may begin to chip away at the market share of the mainstream social networks. In order to explain this properly we need to look back before we look forward. Mainstream social media use is still a very new thing even though it feels like we never knew an existence without it. Prior to 2008, when Twitter and Facebook legitimately took the world by storm, social networks existed but they were confined to a certain audiences and age groups. There have been a number of reasons for this explosion which have all been covered ad nauseam, but the key factors have been technology (especially the rise of the Smartphone) and the human desire to be connected and informed. An argument exists that says we’ve got drunk on mass hyper-connectivity and still haven’t reached the peak yet, but eventually things will settle down. 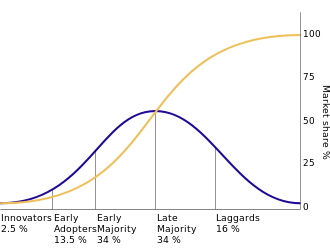 The diffusion of innovation model by Rogers suggests that social media usage will follow this path. 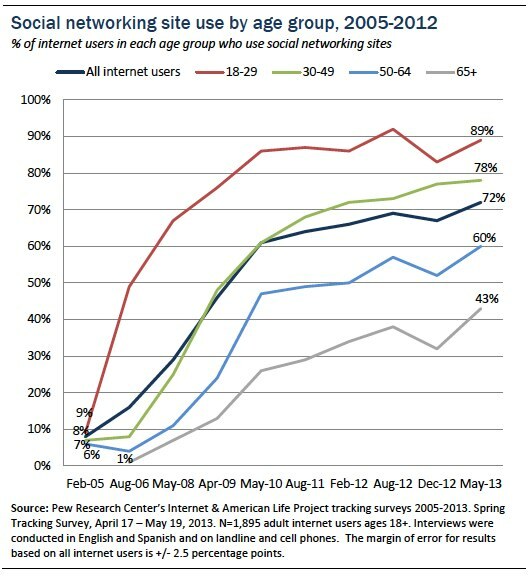 We’re already seeing it with teens, recognised as early-adopters, leaving mainstream networks like Facebook. It is important to note that teens aren’t using social media less, they are just participating in different places including Snapchat, Instagram and WhatsApp. 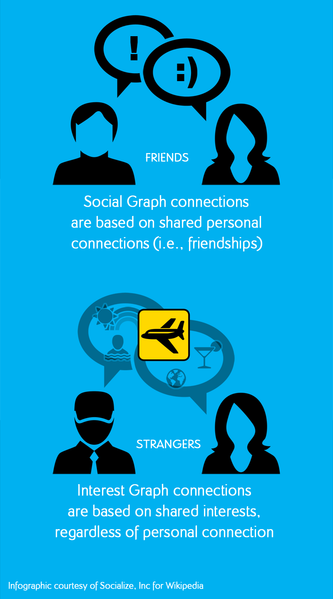 This trend, and the focus of Facebook on the ‘interest graph’ and Google on the ‘knowledge graph’, is part of why we believe interest-based niche networks will rise in popularity in 2014. In truth, we’ve already seen these networks become more popular, but next year is likely to be the year they take some of the more traditional social networking market share. There are already thousand of examples of these interest-based networks. A great example of a niche interest-based community is Learnist, which is essentially a Pinterest for teachers. Cadbury UK is an example of a brand that has recognised this trend and established an interest-based community on Google+ called Cakes + Baking where people are invited to share recipes and food inspiration. More than 80,000 people have joined the Cadbury Cakes + Baking community. It is important to take note of this trend because we’ve traditionally been told it is possible to develop communities around brands which is something I’ve always struggled with. While this is possible for brands who have traditionally followed brands and show a lot of ‘brand love’ (like Ikea), most brands aren’t loved to that level. This is why the best brands and business on platforms like Facebook base their presence on sharing information around 2-3 topic areas that they have the authority and permission to talk about. The brand or business message is made the secondary focus. As we’ve touched on, technology adoption models and other indicators are driving our prediction around the increase in mainstream popularity of niche interest-based networks in 2014. Mainstream Social Media Fatigue – The novelty of social media will potentially decrease over the next 12 months among the ‘late majority’ and they will want more from their social web experience beyond only pictures of their friends having babies. Evolution of Search – We all know that search has become more socially-shaped so we’ll see more ‘information hunting’ influenced by our social connections. Drowning in Noise – With so much activity going on across the social web, locating things that interest you in on platforms like Twitter is becoming increasingly difficult. This may see people segment their social media behaviour by joining niche networks where they get what they want without having to wade through endless and often irrelevant noise. Integrating News with Social – The rise of BuzzFeed and mobile apps like Bleacher Report’s Team Stream is really solid evidence of the rise news-driven communities. People forget that communities can be built around publishers. In fact, some of the best examples of communities can be found in the comment sections of popular blogs. Bleacher Report’s Team Stream integrates social media reaction in real-time and encourages submissions from fan who are active on social media which develops a real sense of community too. This trend will not be a black and white thing if it does eventuate. But, we anticipate you’ll see interest-based networks talked about with more regularity in 2014 as more reports are released about the changes in use of the mainstream networks. The only thing that may impact upon this is if the major platforms nail content personalisation which is another trend we’ll touch on later in this series. Part three of our Social Media Trends 2o14 series will look at the rewards long-time content creators will reap in large amounts in 2014. Kamber is a specialist content marketing and social media agency based in Australia. We help brands and businesses plan, produce, publish and promote digital content that people crave.